Amity is a peaceful friendship between two parties, particularly between two countries. Your antagonist is an opponent in a competition or battle. If you are bellicose you behave in an aggressive way and are likely to start an argument or fight. If you describe someone as benign it means that she is kind, gentle, and harmless. Bonhomie is a friendly feeling among a group of people. If you describe a person’s behavior or speech as brusque you mean that she says or does things abruptly or too quickly in a somewhat rude and impolite way. Camaraderie is a feeling of friendship and trust among a group of people who have usually known each over a long period of time. Someone who is cantankerous is bad-tempered and always finds things to complain about. A cavalier person does not seem to care about rules, principles, or other people’s feelings even if the situation is serious. Someone who is churlish is impolite and unfriendly, especially towards another who has done nothing to deserve ill treatment. If someone is granted clemency, he or she is punished less severely than he could be, having been shown mercy. If you are complaisant you are willing to please others and do what they want without complaining. Conciliation is the process that is intended to end an argument between two groups of people. When someone is contentious he is argumentative and likely to provoke a fight. If you are contrite, you are very sorry or ashamed because you have done something bad. If someone is described as crotchety he tends to be older, hard to please, and very touchy or irritable about even the smallest perceived inconveniences. A curmudgeon is someone who complains a lot, and is highly irritable, difficult, and grumpy. If you say something is diabolical you are emphasizing that it is evil, cruel, or very bad. Draconian rules and laws are extremely strict and harsh. If someone is inimical, it means that he is unfriendly and will likely cause you harm. If you inveigh against something you criticize it very strongly. Jingoism is excessive nationalism, including the strong belief that your country is better than other countries. Someone who is jovial is in a good humor, lighthearted, and jolly. Someone who is litigious tends to quarrel with other people quite a bit, and is the type of person to bring lawsuits upon others. If you say someone is obstreperous you think that he or she is noisy, unruly, and difficult to control. Someone who acts in an ornery way is mean, cranky, or highly irritable. Someone who has a peevish personality is easily annoyed and tends to complain often. A pejorative word, phrase, or expression expresses a bad opinion of someone or something. To act in a pugnacious manner is to act in a combative and aggressive way. Someone who is sullen possesses an ill humor, and so is generally gloomily silent and brooding much of the time. To come out of something unscathed is to come out of it uninjured. Old European tales are filled with truculent, bullying, and aggressive characters who argue a great deal. Who could forget the grumpy, bad-tempered, and truculent troll who jealously guarded the passage across his stone bridge in “The Three Billy Goats Gruff?” Also memorable is the savage, hostile, truculent giant in “Jack and the Beanstalk” who chases Jack down from his castle in the sky, swinging his club in violent anger. Quiz: Try again! When is someone truculent? When he acts in an aggressive and quarrelsome way. When he is hopeless or lost, and does not know what to do. When he is part of a tale that is untrue. Violent Truck Imagine truculent Chuck as a violent truck and you'll understand why he's a bully of students and teachers alike. 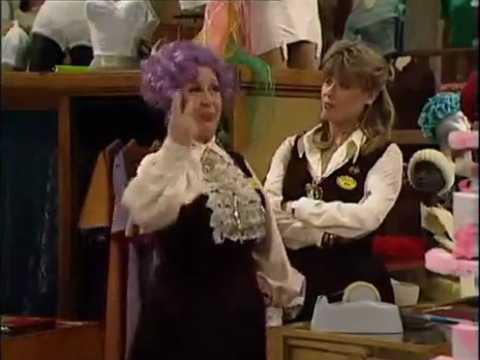 Are You Being Served Mrs. Slocum is certainly truculent!